Hey beauties, kajal is something that we all love, specially to make that bold statement! It is like an essential thing, every girl needs. Even when you decide to go without make up, the tiny tinge of kajal can make you look bold and confident. Therefore it is loved by women, worldwide. Keeping up with the current makeup trends is not easy always. And specially those school or college going girls, they have to restraint themselves within a specific budget. So here I am and as your magician, present to you an affordable option of one such kajal which you can definitely opt for. So, lets get started! Availability: In all Patanjali stores. Online on Flipkart and Amazon as well. Packaging: It comes in a cardboard packet. The inner packaging is with a twisting mechanism. Staying power: It will stay upto 5 to 6 hours. Application: just the way you apply your regular kajal. 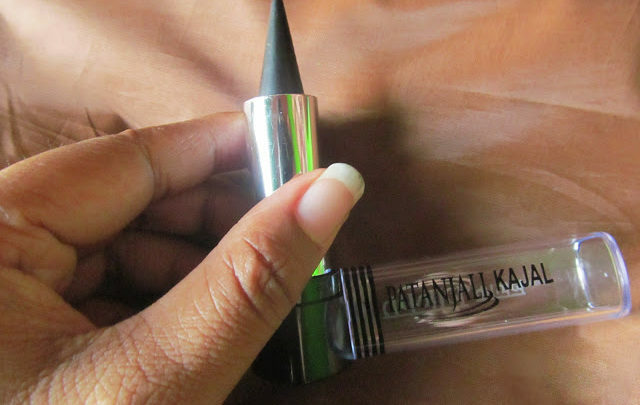 It is an amazing kajal for the starters as well as for, regular usage. It is buttery smooth to apply in one stroke and you will get to see its wonder as a dark pigment. Another thing I absolutely love about it is its dark pigment. In one swipe you can get your desired look. You don’t have to rub unnecessarily. It soothes your eyes with a cool sensation. It has a very sharp tip making it easy for application. My final verdict for this kajal is that, it is a good kajal based on an affordable range which you can definitely give a shot to. It has a long staying power too! Try it now!